View More In Upright Vacuums. An ultra-quiet, powerful, and lightweight upright with Advanced Swivel Steering for excellent control when maneuvering around furniture. It has a completely sealed system with a HEPA filter to trap dust and allergens inside the vacuum. The LED lights and Brushroll Shutoff allow for versatile cleaning on any type of surface, with any type of debris. 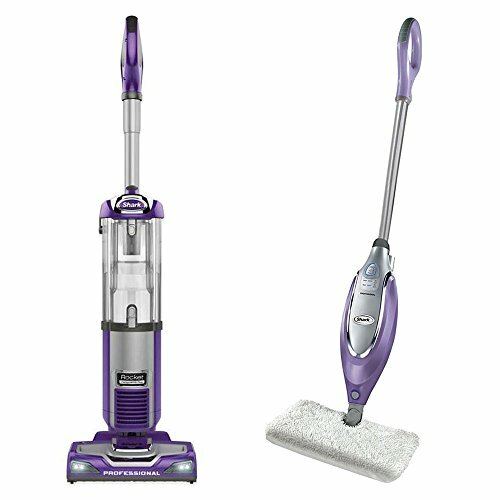 The Rocket Professional Performance Plus Upright Vacuum from Shark cleans carpets and bare floors quickly and efficiently. Equipped to gobble up even the smallest debris, this vacuum is the only one you'll ever need. Features advanced swivel steering.\nThis package also comes with a Shark pocket mop! Checking things off of your cleaning to-do list feels good, and this Shark Pocket Mop loves helping you get things done easily and hassle-free. This mop has 2 settings of electronic Intelligent Steam Control for dusting and mopping and comes with a 2-sided cleaning pad. It heats up in less than a minute and has continuous, super-heated steam that cleans, sanitizes, and dries to offer 99.9 percent sanitization without using chemicals. There is an electronic steam control button to adjust the levels to suit your needs as well as a steam-ready indicator light. You can easily maneuver through your kitchen and hallways with swivel steering and an 11.5-inch cleaning width.